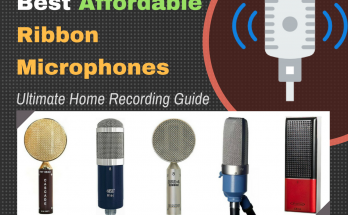 In this microphone guide we’ll take a look at some of the best studio mics for home recording studio use. Quick answer: The Neumann TLM 103 is often considered to the be favorite among professionals, though it’s a little pricey. If you’re looking for a good budget option, take a look at the Audio-Technica AT2035. A great middle-of-the road option that doesn’t disappoint is the AKG Pro Audio C214. However, if you’re looking for something a little more specialized, like for drums, guitar, or even the inside of the piano, we’ll cover those options in this guide as well. We’ll also go into what makes each microphone good, their unique qualities, specs, and what others who’ve used them had to say about them. By the end of this post you’ll know exactly what your next microphone should be. These are the best studio mics for home recording you can get on the market. If you need help making a decision, take a look at the buying guide section of this post. If you're looking for a studio microphone for under 500 dollars, for the purpose of recording an acoustic instrument (like a guitar) and some other general recording applications like drums, guitar amps, and vocals, check out the AKG Pro Audio C214 studio mic. It was designed to be a relatively inexpensive microphone for professional use. But even though it doesn't carry the heft price tag of the studio microphones I will mention, it generally provides the sort of confident sound that audio engineers and producers need to get good recordings in their studios. The C214 studio mic is a large diaphragm condenser microphone with a cardioid polar pattern. As a condenser microphone, it sounds the best when used on an acoustic instrument. The capsule itself provides a quick transient response, meaning really nice details in definition can be heard in the picks and strums of a guitars, as well as slaps and hits on percussion. It's found its use on recording drum rooms, drum overheads, and even a guitar cabinet as well. The versatility comes from having a fairly flat frequency response, with a slight scoop between 1 kHz to 2 kHz, and a presence peak at around 13 kHz. Plus the ability to apply a -20 dB pad gives you the ability to protect the sensitive capsule from the large dynamic pressure you'd get from a drum or amp. You can also use the high-pass filter to cut away the top end, depending on what you want to record with it. Finally, vocals are not left out. As a condenser microphone you can expect it to be very sensitive to subtleties of a singer's voice. Some have found that this microphone provides a characteristic "roundness" to the vocals that it records, while keeping things clear and transparent. The AKG Pro Audio C214 studio mic is a great and versatile microphone for home recording. It's a safe middle-of-the-road option if you want to get one general purpose studio microphone without having to spend a lot of money. It's a modern classic that gets constant good reviews. If you're into recording anything acoustic, getting this microphone, for the price, is a no brainer. It brings consistent satisfaction across many applications, making it one of the best studio microphones for all-round usage. A definite recommendation if you haven't got it as yet. Read the customer reviews @ Amazon. You could possibly consider the Audio-Technica AT2035 studio mic the no. 1 most popular, and probably most sought after, microphone for those building a home studio on a budget. In fact, this microphone can probably be found in every home studio collection, since it's often the "first microphone" that many producers gets. Not just that, you can find this microphone in many professional studios, as well as used in live settings. These, factor, as well as its other essential qualities, is what allows this microphone to win a place on this list. The AT2035 studio mic is a large diaphragm condenser microphone, with a cardioid polar pattern. It's considered a truly general purpose condenser microphone. But being a condenser, you can expect it to do well on sources like vocals, drum OH, and acoustics. That means if you're getting one of these, I'd suggest you get a dynamic microphone as well (I recommend the Shure SM57, which is also in this list). That way, you get the best of both worlds and spend just under 250 dollars, total. That's a great budget buy. Anyway, the quality of the AT2035 is considered honest, especially for being a budget condenser. Budget condensers are kind of tricky, because of the sensitivity that the capsule has to sound pressure hitting it. There is a tendency for cheaper condenser microphones to come off as overly bright, shrill, and thin, and not in any controlled way. Gladly, the AT2035 doesn't produce too much of an overwhelming lift in the highest frequencies. And in some instances, it captures the warmth of vocals and acoustics very well. The AT2035 features a switchable 80 Hz high pass filter if you want to roll off the bass of your audio source. And there is a -10 dB pad that you can use to protect the capsule from loud audio sources. When you purchase the AT2035, you get a custom shock mount, and protective soft pouch for storage. When it comes to the best studio microphones on a budget, the Audio-Technica AT2035 studio mic tops that list. Especially if you're just getting into build a home studio. With the AT2035 studio mic, you get professional grade quality for for a cheap price. More than likely, if you have a home studio, you already have this microphone in your collection, and are either looking for an upgrade or for more options. Either way, all can agree, it's a great "must have," particularly if you're new. The Neumann TLM 103 studio mic is the benchmark of project and home recording studios, as well as professional industry standard studios. It's suitable for recording practically anything, but it shines particularly well when you set it up to work on recording a singer or an acoustic guitarist. This makes this an exception choice for singer-songwriter producers who want the best quality for their money. And is, in fact, the studio microphone of choice by famous artists such as Justin Timberlake and Beyonce. Hence, you can also expect a heftier price for the quality. The Neumann TLM 103 studio mic is a large-diaphragm condenser microphone, with a cardioid pickup pattern that will minimize the sound of the room to focus on the audio source before it. It has a very low self-noise and a very sensitive capsule that makes it quite suitable for recording acoustic instruments. For a condenser microphone, it is consider a little bit on the bright side, primarily because of how sensitive the microphone is to the higher frequencies. A few don't like that, but others, especially rap artists and broadcasters, love the clarity and definition the sensitivity capsule produces. This makes it excellent at picking up details for clarity the words of a song or speech. It also produces that "modern sound" that many producers go after these days. However, despite its modern bright sound, it does manage to retain a level of warmth often missing in the typical condenser microphone, which, makes it a lot more natural sounding, and not at all shrill. Despite the price tag, Neumann considers this their "low-end" microphone. Neumann is really a "high-end" manufacturer, and it is true that their microphones can go into the multiple thousands of dollars. The level of quality of microphones that they produce often times allows the sound engineer working with them to use minimal to zero EQing on their recordings. You'd find that this would be the same for you, if you decide to purchase the TLM 103 studio mic. 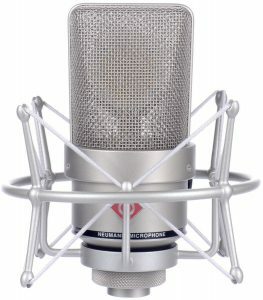 The Neumann TLM 103 studio mic is one of the bestyou could get for your home recording or project studio. You can use it to record great vocals, guitars, and other instruments without having to do much "fixing" in your mixes. The only thing is that the TLM 103 studio mic may require of you, is ensuring that you're recording your audio sources in a properly treated environment. Because it is so sensitive, you'd be surprised how well the microphone will be at listening in on things you don't want in your environment. You can record either speech or music with the Sennheiser MD 421 II studio mic. It's a classic microphone that gives you two settings to choose from, both settings allowing you to go from, say, recording for a podcast, to recording your guitar amp with just the flick of a switch. So the MD 421 II studio mic is a super versatile microphone that can work with many audio sources, but especially shines on sources that a pretty loud and prone to giving other sub-par microphones feedback. The MD 421 II studio mic is a dynamic microphone with a cardioid pickup pattern. As a dynamic studio mic, you can expect it to handle situations less ideal for condensers, like on drums and amps. The design of the microphone itself is physically rugged, giving a feeling of security-- in other words, it's not too "delicate" a device to set up. One of the most famous application of this microphone, also, is in broadcasting, and it's also been used for recording backup vocals. Where the MD 421 II studio mic particularly shines, however, are on recording amps and drums. Pair this with another dynamic, condenser, or ribbon to get a richer sound from your amps. On drums, they are very popularly used on toms. Mainly because they capture the full spectrum of tones produced by a tom better than many other dynamic studio mic. And in addition to the speech and music switch I mentioned earlier, the 5 position bass roll-off switch gives you some recording flexibility, allowing you control over how much bass you want to reach your console or DAW. What engineers who use the MD 421 II studio mic have much to say in the way of praise for it. Much personal reviews claim that it offers one of the cleanest and fullest sound you can get form a dynamic studio microphone. It has a pretty low end (hence the bass roll of switch) so it's often found used on kick drums as well. The only major complaint is that the microphone clip can be a little cumbersome, requiring sometimes the necessity of tape. The Sennheiser MD 421 II studio mic for home studio is a great go-to microphone that can fulfill the majority of needs. It is a highly ubiquitous microphone you literally find everywhere, even in live performances. So if you plan on doing any recorded speech, podcasts, or recording loud instruments or amps, this is definitely one of the best studio microphones you can get for the money as an alternative to the studio condenser microphones on this list. 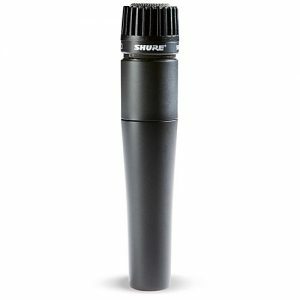 If there is one microphone you should have from this list, it has to be the Shure SM57 instrument microphone. This thing ubiquitous, and you've most likely held one of these things in your hand already, even without realizing it. It's not just popularly used in studios, but on stage. It is a loyal classic that is tough, rugged, and can take a beating. And because it's cheap, your pocket won't suffer for losing it. It's actually hard to review the the SM57 studio mic, mainly because it's so popular, finding things to say about it seems a little immaterial. But for some reason or another, if you weren't aware of the SM57 studio mic, you'd probably end up skipping this and get something else on this list. This I, and many other pro audio users, would advise against. If you absolutely have to have one and only one microphone for recording instruments, it has to be the SM57 studio mic. Once you get the SM57 studio mic, you can compliment it with a condenser (like the AKG Pro Audio C214 studio mic), a ribbon (Beyerdynamic M160 studio mic), and another high-spec dynamic (Sennheiser MD 421 II studio mic) as you choose. Spec-wise, the SM57 studio micis a standard microphone that captures sounds naturally, without much frills or excitement. The "sound" of the SM57 studio mic is actually so definitive that an audio engineer may bypass a high-end microphone for the sound of the SM57. Or use the SM57 paired with another microphone. It's most popularly used on recording instrument amplifiers (guitars and basses specially) as well as drums (snare, toms, timbales, even the kick). However, it's also VERY popularly used on vocals, especially in live settings. The SM57 is also a cardioid microphone, so it does a pretty good job at isolating the sound source that it is pointed at. It has a very flat frequency response in the midrange, with a "carefully contoured presence rise" up the higher frequencies. It's not the most subtle sounding microphone, but it will get the job done. Both on the stage and in your studio. The Shure SM57 is a must have for your studio. You can count on it that more than 2/3 of the recordings in your music collection used an SM57. If the pros use this, then you have no reason why you shouldn't have this if you do any instrument recording. Some would even say that the the Shure SM57, despite its price, is the best studio microphone ever made. Do you want a microphone designed specifically for vocal and solo acoustic instruments? The AKG Pro Audio C414 XLII studio mic was created for that purpose. Yet it works excellently when paired with a dynamic on guitar cabinets. So just like the Neumann mentioned above, this makes it practically useful for any sort of audio source. This makes the C414 XLII studio mic also one of the most recommended, most purchased microphones, for anyone looking for pro-grade quality for the money. 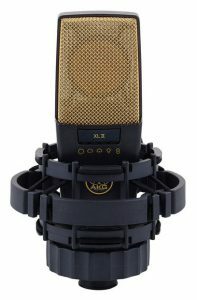 The AKG Pro Audio C414 XLII studio mic is a large-diaphragm condenser microphone, with multiple polar patterns. You get to choose among nine polar patterns when using it. So you'd find this a very versatile microphone when applying it to recording your audio sources. This includes omni, cardioid, wide cardioid, hypercardioid, and figure-of-8. You can also add more presence to your recordings with its presence boost feature as well, if you feel that your recordings sound too flat. It also has a pad and filter to attenuate the sound reaching the capsule, as well as filtering out high or low frequencies, based on the kind of audio source you're recording. These settings make this microphone one of the few condenser microphones you can safely use with drum. It's also very convenient, as the settings are operated by buttons on the microphone. AKG is a name that you'd probably be very familiar with, either by now, or eventually. They make some of the best gear, from headphones, to studio monitors. And all their gears are designed for profession studio use. So when you purchase the C414 XLII studio mic, you get a low-profile shock mount, a foam windscreen, a pop filter, and a well padded aluminum flight case. The AKG Pro Audio C414 XLII studio mic is one the best studio microphones you could buy for the money. It comes at professional price tag, but the value really speaks for itself when you assign it to your recordings. Its most popular buyers in the home studio market tend to be sing-songwriter music producers. Sometimes they are bought in pairs for added flexibility of having multi polar patterns and filter options to combine with your audio source. The Beyerdynamic M160 studio mic is a timeless classic microphone that originated all the way back in 1957. It's a ribbon microphone, and one of the most popular ribbons on the market. As a ribbon microphone, you could technically use it on many recording sources, from vocals to drums. But sound engineers find that this microphone shines the best on brass instruments, as well as pairing with a dynamic microphone on a guitar cabinet with lots of drive. Ribbon studio mics are characterized as having a warm sound that slightly rolls off the high frequencies in favor of the lows. This is the case for the Beyerdynamic M160 studio mic. So if you're recording an overdriving guitar, you're not going to find the need to do a lot of EQing to minimize any "shrillness" in your recordings. Plus, it uniquely has a hypercardioid pickup pattern, meaning it will record directly the source that you point it at. Many ribbons tend to be figure-of-8, so you'd get a recording pattern in opposite directions instead. Another great quality you'd probably like about the Beyerdynamic M160 studio mic is that it has an ever so slight presence boost in the upper frequencies. Users have found that this ribbon microphone shines in quality above many other ribbon studio mics because of the very fact that ribbons can, depending upon your sound source, sound a bit muffled. A little bit of presence makes it a more balanced sounding microphone. Another well known application for the Beyerdynamic M160 studio mic is on drums. The presence boost can really give snare drums that "snap," while providing it with the rich color and full bodied warmth you'd want in a mix. In addition to brass instruments, strings, particularly cellos and violins, sound smooth and lush when recorded on the Beyerdynamic M160 studio mic. Since ribbons are highly sensitive, the details are pristine, but you don't have to worry about any possible unpleasant "screeches" destroying your string recordings. If you're the market for a ribbon microphone, or for a microphone for the applications I described above, take a look at the Beyerdynamic M160 studio mic. It's constantly highly rated. It's loved so much that it's been in consistent production for over 60 years. A vintage classic you can't miss. You can also take a look at some more affordable options if it's outside your buying range. The Shure Beta 91A studio mic is a specialized microphone with a funny design that makes it great at doing what it's supposed to do: recording the insides of an instrument. Most notably, inside of a kick, or inside of a piano. It's been praised for how accurate it sounds in both applications (or any other application you need to capture the inside sounds of an instrument), because the microphone's high SPL capability (sound pressure level), it can capture the sound of, not only the source itself, but of the loudness of the entire space it is in. The Beta 91A studio mic is a condenser boundary microphone. This means that is has a half-cardioid polar pattern. You use this by placing it, literally, against the boundary of the instrument. So for a kick drum, that would meaning letting it sit on the floor of the kick, by resting on a blanket. Of if you use it on a piano, tape it up under the lid of the piano and close it. Everything except the surface that it is resting against with be recorded this way. The Beta 91A studio mic makes an exceptional a kick drum microphone for three reasons. For one, it has a very great low end response that extends all the way down to 20 Hz, so it will pick up sub bass sounds within your kick. You can always roll off some of the low end (below 300 Hz) with an EQ switch on the microphone. 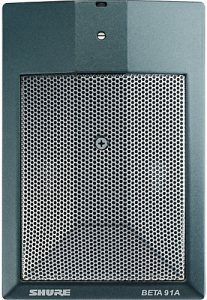 Second, the Beta 91A studio mic has an incredibly flat frequency response. And third, being a condenser microphone that fits inside your kick, you get to capture the initial "click" of your kick with uncompromising clarity. 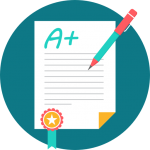 When it comes to piano, the flat response means an honest and clear representation of your piano recordings. And being a condenser, it has a fast transient response that captures the subtleties of the hammers striking the strings. The Shure Beta 91A studio mic is great microphone. If you have the specialized need of recording the inside environment of an instrument (or room), this is one of the best studio microphones you can buy. But the vast majority of happy users tend to be kick drum sound engineers working on getting the perfect kick drums sounds, whether for studio or live situations. The Audix D6 studio mic is a great studio microphone designed for kick drums. You can also use it on bass amp, floor toms, or a Leslie bottom. In essence, it's a low frequency microphone that can record accurately any instrument which produces powerful bass. And it's suitable for both live stage settings, as well as studio recording. The D6 studio mic is a dynamic microphone with a cardioid pattern specifically tuned for the kick drum. It has a rather unusual frequency response curve: there's a wide scoop in the middle, with the peaks at both the high and low ends of the spectrum. It's understandable that, as a bass and kick studio microphone, you'd want it to give preference to the lowest frequencies. But the response to the higher frequencies provide more presence (high frequencies) in the kick sound, the frequencies get the characteristic sounds of the thuds and clicks of your kicks to push through in a mix. As I said, the D6 studio mic is not just great for kicks, but also for bass amps. The unique response curve allows the bass player's slaps, slides, and other characteristic sounds of the instrument to have a place in your mix. And it captures the full bodied roundness of floor toms very nicely. The result of each audio source is a thick and "beefy" sound, with a lot of character. The microphone itself is considered smaller than the usual bass and kick microphones, and is relatively lightweight. This is good in terms of finding a position for it in your microphone setup. However, unlike the Shure Beta 91A studio mic, it is directional, meaning you'd have to take care where you point it. However, for this reason it really does a top job at isolating the sound source, ensuring that feedback is minimized to nothing. The Audix D6 studio mic is a great microphone for home recording to have if you want to get the best sound for your kicks and bass. You can use it live or in studio, as it can definitely take its beating, and reward you for it. The Blue Yeti Pro USB studio mic is a great microphone if you just want to quickly and easily plug your microphone into your computer or laptop, without having to go through an audio interface. Like the name suggests, it is a professional microphone that uses a USB connection, instead of relying solely on the standard XLR connectors found on standard pro audio gear. That's because it already comes with a built in microphone preamp and DA converter (digital-audio conversion). That makes this microphone the top choice if you want to do podcasts, and record high quality acoustics and vocals in a personal desktop-workstation personal studio sort of configuration. The Blue Yeti Pro USB studio mic is a large diaphragm condenser microphone. The large diaphragm means it's versatile enough to pick up high and low ends with clarity. Low ends of vocals, if you're doing podcasts, sounds great, and the high end response picks up the transients and high frequencies needed to get good acoustic guitar recordings. There are four polar patterns in total, cardioid, figure-of-8, omni-directional, and XY stereo. You can select these patterns from one of the switches on the microphone itself. The switches control gain, master volume (for headphone jack), and the mute button. The cool thing I just mentioned, which I like, is that you can actually connect your studio headphones to this microphone for direct monitoring. Additionally, there is the option of connecting your microphone via XLR cable. So you can actually use it in your home recording studio with your audio interface, after all. The Blue Yeti Pro USB studio mic is actually the upgraded version to the standard Yeti, which costs about 100 dollars less. The difference between the two is that the standard version lacks the XLR connector, and the Pro version can run digital audio input of up to 24-bit and 96 kHz to 192 kHz audio. The standard version can only input digital audio of 16-bit and 48 kHz. Otherwise, they are pretty much identical. If you prefer the cheaper version, you can check it out at this Amazon link. The Blue Yeti Pro USB studio mic is a beautiful microphone with a retro look that produces professional level quality, and in a convenient package. It minimizes the need for a lot of gear, and can sit right on top of your desk to record vocals, speech, or instruments. Best for podcasters and if you just want to record some acoustic guitar or other instruments. Choosing the best studio microphone for home recording can be tricky business. Yet, it's one of the most important decisions you'll need to make. Microphones are your "ears" in your studio -- it's on them you rely to transmit performances into successful sound recordings. But there are so many different kinds of microphones. And each kind of microphone is designed specifically for a certain kind of audio source. Add to that the various qualities that exists, and brands, and you'll be spending hours on the internet and on gear forums hunting down for the opinions of others. 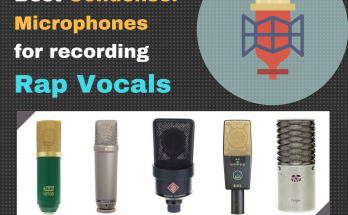 That's why this guide compiles all the best microphones to choose from into a list of 10 easy choices, arranged by type, audio source, and from high end to low budget. 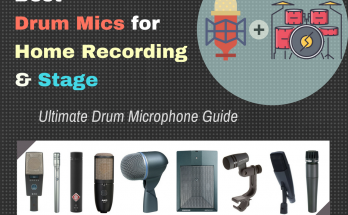 Now, let's talk about the type of studio microphones in this guide. The majority of home studio recording microphones fall under the first two categories that I've listed above: Condenser, and Dynamic. But before talk about that, let's investigate how each microphone works. The condenser microphone is often the go-to microphone for beginner home studio owners. Mainly because they would've read somewhere that condensers provide "the best sound quality." A condenser microphone does pick up very high-quality recordings, especially in the higher frequencies, because of the way it is designed. The condenser microphone consists of a small capsule which houses a tiny electrically conductive membrane. The membrane is placed very closely, without touching, to a metal plate. The space between forms what is called "capacitance." As sound is picked up by the capsule, the tiny membrane vibrates due to the air pressure around it. So the distance between membrane and plate changes rapidly, changing the capacitance. This causes an electrical signal, and this signal is what your DAW or amp recognizes as sound. Because of how tiny and sensitive the membrane is, condenser microphones are excellent for recording the most sensitive variations in sound, all the little overtone shimmers, with pristine detail. These mics could pick up a pin drop at a distance. However, because they use very tiny membranes, they can also be easily damaged in extreme sound environments, like loud drums or basses. That is why, even though condenser microphones are great for high-quality home studio sounds, they are also poor choices in some other instances. Condenser microphones are also what you call "active microphones" because they require external power, or, "phantom power." However, most audio interfaces will come with a mic preamp, so this wouldn't be anything to worry about, since, in most cases, you'd need an audio interface if you're planning on using a microphone. Dynamic microphones are often the best go-to microphones for on-stage use. They're durable and can withstand some abuse. Not only that, they are able to record the most extreme sound dynamics that would otherwise damage the condenser microphone. However, while they make for the best studio microphones for extreme dynamics, they are less sensitive and responsive to the higher frequencies. With notable exceptions (like recording rap vocals or rock vocals) dynamic microphones are not generally used in the studio for recording vocals and acoustic instruments. Also, unlike the condenser microphone, they don't require phantom power. That's because the diaphragm in the microphone can generate enough power to send an audio signal to your mixer or DAW. Think of it like a reverse loudspeaker. As sound air vibrations reach the small diaphragm, it moves a coil through a magnetic field, causing an electrical signal to be generated. They are not as often used, but they are the best studio microphones for certain applications. Let's talk them. Ribbon microphones are named after a thin ribbon that is excited by the velocity of the air that comes in contact with it. So, they don't work by air pressure surrounding the microphone pick-up, like in the condenser or dynamic. Ribbon microphones then are highly sensitive, and should be used with care, as they will break very easily. However, in exchange for their delicacy, they reproduce with unparalleled clarity the warmth of an instrument or voice, whereas condenser microphones may, in some cases, be a little too bright. Pairing a ribbon mic with a dynamic is a very popular option for electric guitar amplifiers. Dynamic microphones have a way of attenuating the higher-frequencies, while still being highly sensitive to them. This results in a warm sound. 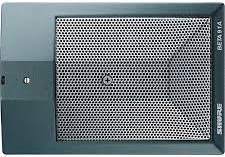 When combined with the dynamic microphone sound, there is full bodied sound that no one microphone can capture from an amplifier cabinet. On electric guitars this is perfect. Especially on overdriven guitar playing. This is because the highest frequencies would be "tamed" a little, guarding your recordings against being too "shrill" and "raspy," while a dynamic will give your guitar the power to cut through in a mix. This is achieved by placing a dynamic microphone up close (usually hanging over the amp onto the grill), and a ribbon at a distance, like around 6 inches. Studio microphones are often categorized by their "polar pattern." This simply refers to the direction the microphone is "listening" to. This is a very important aspect to consider when making a choice in what microphone you should get. Cardioids are the most popular option because these studio microphones pick-up sounds directly ahead of them, limiting the number of ambient sounds to the sides and practically none behind the microphone. These are best for general purposes and can be used to record any sound source, given that you want to limit the amount of sound you get from the room. 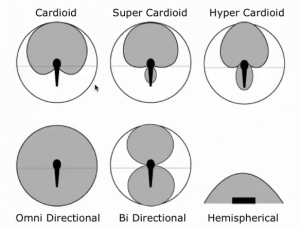 These microphone patterns are just like the Cardioid, but even more extreme, with hypercardioid being the most narrow in direction. You can set these up across the room, and point them directly at an instrument, and they will do a good job of silencing all other sounds but the sound of that instrument alone. Like the name suggests, these will listen in on sounds coming from all directions. Omnidirectional microphones are great if you want to capture the sound of an instrument as it sounds within a room. Figure-of-8s pick up on sounds equally at the front and back, rejecting the sounds coming from the sides. This can be good in circumstances where you'd like to record two vocalists or acoustic guitarists at the same time from one microphone source, by having them face each other with one microphone between them. Figure-of-8 microphones are often mostly used to capture perfect stereo recordings using two common techniques you may try: The blumlein stereo miking technique and the mid-side technique. Boundary microphones are essentially omnidirectional microphones that have a half-space polar pattern. So sometimes they are called "half-cardioid" for that reason. They are usually placed on a surface, whether on the wall on the ground (although they can be mounted on a stand), and pick up everything above its receiver. They are good for phase canceling, and so have been found very useful as room microphones. However, in a home studio, boundary microphones are often the best studio microphones for recording the insides of an instrument. Particularly inside of kick drum, or under a piano lid. Finally, there are multi-pattern microphones. These microphones give you the advantage of switching between different polar patterns. Many professional condenser microphones will have this option built into them. There is another kind of microphone on this list that is not often suggested for home studios, but may be most suitable for a certain kind of user. USB microphones are relatively new developments. But they offer an advantage. With traditional studio microphones, you have to plug them into an audio interface with microphone preamp in order for them to work with the digital audio workstation within your computer or laptop. With a USB microphone, you can plug it directly into your computer's USB port, since it comes with its own built-in preamps and analogue-to-digital converter. USB microphones are most suitable for podcasters who use their home studio for spoken word recordings. But you'll find that many acoustic guitarists and and singer-songwriters are satisfied with its ease of use and ease of setting up. Now that you have a proper understanding of the various types of microphones that exist, you're in a better position to select the best mic for your home studio. Back to to the table. As you would've realized, getting the best studio microphone isn't so simple a task. 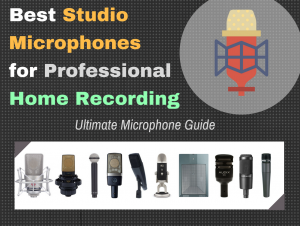 but if you started with the information in this guide, you would've come to realize and understand the different kinds of microphones necessary for each recording application, and therefore made your appropriate choice. This would made you microphone decision far easier than it would've been otherwise. So hopefully, you were able to identify what exactly you needed. Then, reading each of the microphones in this list, you would've made a choice that is suitable for your setup. Otherwise, if you're reading this out of curious, feel free to chime in on your thoughts. Do you have any of these microphones? Did your microphone make the list? And if you are pretty familiar with studio microphones yourself, what do you think is the best studio microphone based on your own knowledge and experience... and why? Finally, please feel free to share this post with anyone you think will find this information useful! This is the result of hours and weeks of combing through the internet. Data was aggregated from forums such as Gearslutz.com, Reddit’s r/WeAreTheMusicMakers thread, product reviews, and buyer reviews from pro audio owners. Customer ratings from Amazon.com and other pro audio sites were used to determine which studio microphones per category and price range was the best rated, and had the most ratings, and then compared that against forum reviews, user testimonials, and personal experience (where applicable). However, which of them would you suggest for someone who loves to play loud sounds? Or it doesn’t matter? Hi, Daniella! Thanks for stopping by. It rather depends on the sort of guitar. I’m not entirely sure what you mean by “loud sounds.” I suggest he takes a look at the article himself. But if by “loud sounds” you mean he uses an amp, then a dynamic microphone with an optional pairing of a ribbon microphone is a good bet. I feature both of these in this post. If he plays an acoustic guitar, then any of the condenser microphones in this list should do the trick. Hi there! Great article, thank you for all the information. I too am big on research and have searched countless sites. One thing I notice, is you have no RØDE mics listed? The NT1-A and Procaster are extremely good mics, and its very odd they are not listed. Hi Brendan! Thanks for your feedback. It is true that the Rodes you mentioned are really excellent microphones. I haven’t overlooked them. They will be featured in another post. Thanks for dropping by!